Wowza! 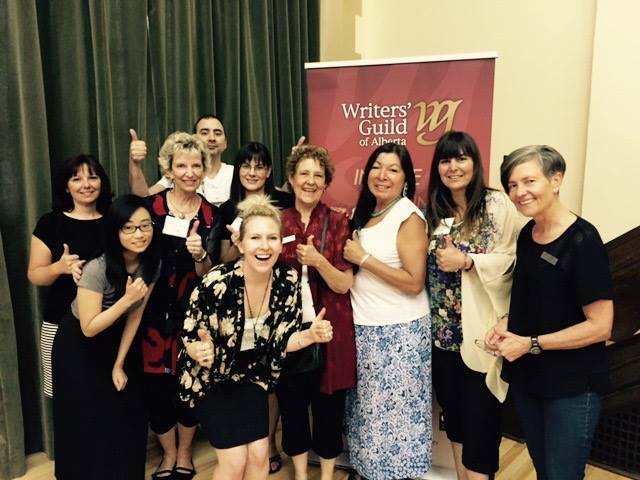 I’m so excited to announce that I was voted in as President of the Writers’ Guild of Alberta on the weekend. Many of my blog followers will know that I’ve been involved with the organization for a few years now, but this promotion is a big step for me, so I feel the need to officially ‘announce’ it here. It’s a great organization- we support, connect, and engage with Alberta writers through various programs, advocacy initiatives, and retreats, and we’ve got close to 1000 members, which makes us the biggest guild in the country. The 2016-17 WGA Board of Directors! During our conference, I was able to meet a few of the people who have held this position in the past. Most of them are well-known writers, which means I have some big shoes to fill: especially because I don’t consider myself a ‘writer’. I’m a reader, first and foremost, and the majority of my ‘writing’ is on this blog alone, which isn’t very creative, compared to the excellent writing of my colleagues that I’m lucky enough to surround myself with. So why volunteer with an organization dedicated to writers, if I’m not one myself? I get this question quite a bit actually. My answer is this: if there were no writers, there would be no books, and the idea of a world without books sounds like my own personal hell. Being a writer isn’t easy; they don’t get paid very much (if at all) and most write in their spare time, which means a lot of evenings and weekends lost to writing a single book. It’s a pretty thankless task, so I’m making it my mission to keep writers happy and healthy, so they can keep writing books for me to read. So, I guess my volunteering is a bit selfish when I put it that way…but that’s what keeps me going! Shameless plug alert: if you are a writer in Alberta, you really should become a member of the WGA. Click here to sign up! Congratulations Anne. I like your justification for your involvement with the WGA (which I should join myself), it is also important to remember that without readers, writers wouldn’t have a reason to write. And of course, writers themselves should be readers first and foremost too. Congrats on the new posting! Well deserved! Thanks very much good sir! Congrats! What you said makes so much sense to me. I’m a reader, much more so than a writer too and ive been thinking where and how I can get involved, and whether it would be weird for me to do so. So you are my role model. WGA seems great, too. I actually applied for a job there a while back. Congratulations Anne, that’s terrific! You are a tremendous advocate for writers, books and book lovers – and a real asset to your board. Time to renew my membership! Thank you Lois, and we would love to have you back as a member!